The application of nanoparticles as selective drug delivery platforms arises as one the most promising therapeutic strategies in the biomedical field. Such systems can encapsulate drugs, prevent its premature degradation, transport and promote the drugs specific delivery to the target site. 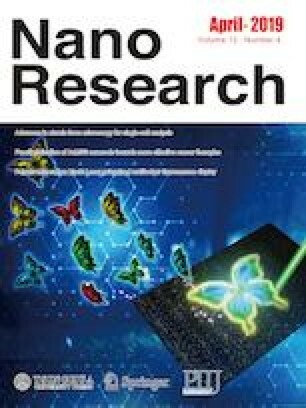 Among the different nanostructures, gold-core mesoporous silica shell (AuMSS) nanorods have been one of the most explored due to their unique physical and chemical properties. The mesoporous silica biocompatibility, high surface area that can be easily functionalized, tubular pores that can store the drugs, conjugated with the intrinsic capacity of gold nanorod to absorb near-infrared radiation, allows the combination of hyperthermia (i.e., photothermal effect) with drug delivery, making them a nanoplatforms with a huge potential for cancer therapy. 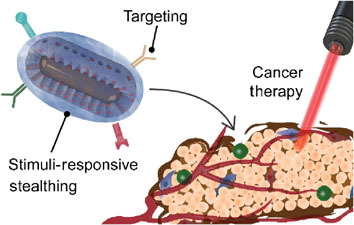 Nevertheless, the successful application of AuMSS nanoparticles as an effective cancer nanomedicine is hindered by the uncontrolled release of the therapeutic payloads, limited blood circulation time and unfavorable pharmacokinetics. In this review, an overview of the modifications performed to improve the AuMSS nanorods application in nanomedicine is provided, highlighting the practical approaches that enhanced the AuMSS nanorods targeting, responsiveness to different stimuli, and blood circulation time. Further, the basics of AuMSS nanorods synthesis procedures, general properties, and its application in cancer therapy are also described. Carolina F. Rodrigues, Telma A. Jacinto, and André F. Moreira contributed equally to this work. This work was supported by FEDER funds through the POCI— COMPETE 2020—Operational Programme Competitiveness and Internationalisation in Axis I—Strengthening research, technological development and innovation (Project POCI-01—0145-FEDER-007491) and National Funds by FCT—Foundation for Science and Technology (Project UID/Multi/00709/2013). A. F. M., S. P. M., and E. C. C. acknowledges their Ph.D. fellowships from FCT (Nos. SFRH/BD/ 109482/2015, SFRH/BD/109563/2015, and SFRH/BD/103507/2014).